Nasal allergies can be caused by a variety of triggers, such as dust, pet dander, pollen, or even some foods. Nasal allergies, officially known as “allergic rhinitis,” have a variety of a different symptoms. Read on to find out more about the common nasal allergy symptoms and how to deal with them. This is typically due to air being prevented from reaching the smell receptors, which are located high in the nose. However, sometimes problems with smell can be caused by loss of or injury to the receptors themselves. This is one of the most common nasal allergy symptoms, and has a ripple effect on the sense of taste - a sufferer might find they are unable to distinguish between flavors. This symptom can be unpleasant, but usually do not last long. This is one of the nasal allergy symptoms that is most commonly associated with allergic rhinitis, occurring because the tissues lining the nose swell up, and this swelling is caused by inflammation of the blood vessels. Excess mucus will normally come out of the nose, but some can run down the back of the throat, which can trigger coughing or a sore throat. This is a sudden, uncontrollable expulsion of air through the nose and mouth, and it's one of the most bothersome nasal allergy symptoms. It is generally caused by irritation to the mucus membranes in the nose or throat. The eyes are constantly making tears throughout the day, which prevents them from drying out. However, since a nasal allergy tends to cause dry eyes, it's common for tear ducts to overproduce tears, resulting in itchy, watery eyes. Nasal allergy symptoms are a nuisance, but rarely a cause for concern. The good news is that they can be dealt with using a few home remedies, some of which are outlined below. Every suffer has a trigger for their nasal allergy symptoms, and so the best way to avoid getting them is to work out what is causing your allergy and then avoid that trigger if at all possible. 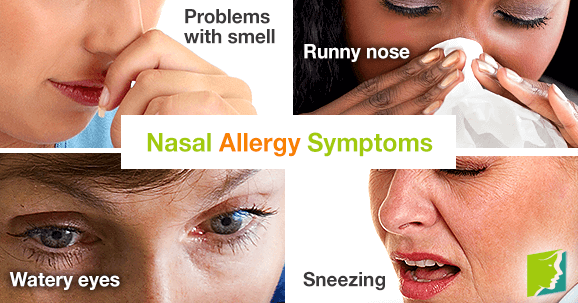 These are useful for the many people whose nasal allergy symptoms are caused by a pollen allergy. This normally occurs in the summer, and many sufferers take antihistamines as a precaution instead of waiting for symptoms to arise. These can come in many forms and are useful for clearing a stuffy and congested nose. They are only a short term measure, however, and should not be used for more than a few days. This can be helpful for people who have dust allergies. Washing linen in hot water to kill dust mites, changing beds regularly, and using air filters in the home are all good ways of reducing the amount of dust exposure in your home, decreasing the frequency and severity of nasal allergy symptoms. Most people are familiar with nasal allergy symptoms and will experience them at some point in their lives.For further information on how to handle this symptom click here. The effects of allergies can be a hugely frustrating and irritating problem, especially during spring and summer, when the symptoms of hay fever reach hits. Fortunately, there are things that you can do from the comfort of your own home to fend off allergy attacks. During menopause, many women suffer from triggered allergies.Menopause can bring worsened - or even new - allergy symptoms. This can turn the warmer months into a difficult time.Learn how to cope with summer allergies.